Click here to read more about Alfred Lalara. Alfred Lalara was born in 1964. Like his sister-cousin, author Rhoda Lalara, he is from the Lalara clan and he grew up in the Warnindilyakwa community of Angurugu on Groote Eylandt. One of many talented artists in the Lalara clan, Alfred uses the traditional Groote Eylandt line work, which in the past was used for painting on bark and is now used for works on canvas and paper. 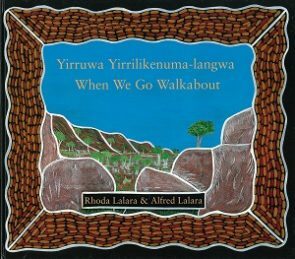 Alfred usually works collaboratively with his wife, Alice Durilla, who did the raak cross-hatching on the illustrations in Yirruwa Yirrilikenuma-langwa.